Halloween is one of my favorite holidays. I love sewing costumes for my kids and seeing all the creative costumes out there. Let's go in a time machine to Halloween of the past. 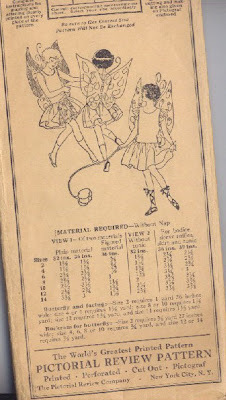 Here is Pictorial Review 1935 - for a 6 year old child. Description: Girls' Fariy Costume. Butterfly wings add charm to this delightful costume. The long waisted bodice has an oval neck, and may be work with or with ruffles at armholes. A 3 piece tunic, open in front, is arranged on the 2 piece gathered skirt and both are joined to the bodice. Circa 1925. 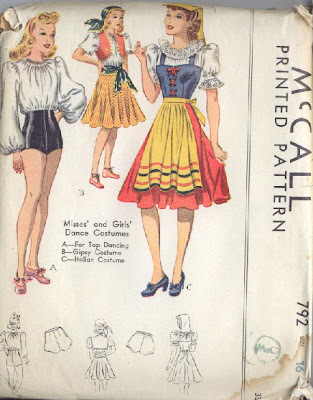 Let's skip to the 1940s to look at McCall 792 - A dance costume for tap dancing, Gipsy [sic.] and Italian Costumes for a 16 year old girl. One of my favorite costume patterns is probably not a costume - but a dress. This one really reminds me of Alice in Wonderland. 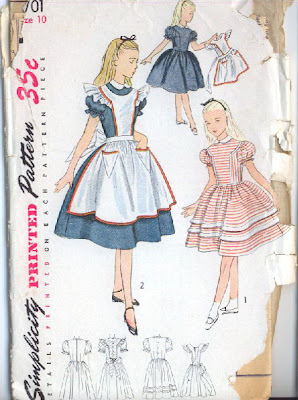 This pattern was printed in 1951 - which is the same year that Disney produced their animated Alice in Wonderland. I'm guessing this is not a coincidence. This is Simplicity 3701 for a 10 year old girl. Printed 1951. 1 piece dress and pinafore. 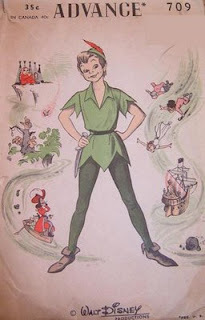 Here is an authentic Peter Pan costume produced by the Advanced pattern company. It is very likely that this pattern was produced the year the movie was release (1953). This is an unprinted tissue pattern. Notice the Disney logo. Pattern information: Advance 709. Just too cute! In the 1980 - 90's Disney worked with the Simplicity pattern company to produce a line of costume patterns. 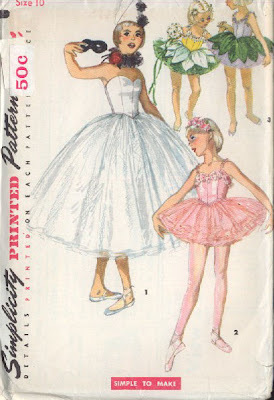 More designs from the 1950s: Butterick 6550. 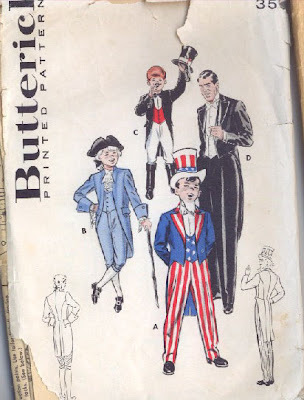 Set of Costumes: Uncle Sam, George Washington, Ring Master, Full Dress. For those of you who want a truly throw away costume. You could make one out of large pieces of crepe paper. I've seen similar books dating back to the 1920s. 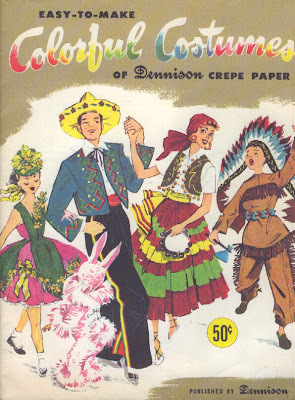 This is the 1960s edition of the boo: Easy to Make Colorful Costumes of Dennison Crepe Paper. You have to be really good at cutting to make these. Some of them still require sewing - some costumes you can tape together. If you want to throw a 1920s Halloween party. 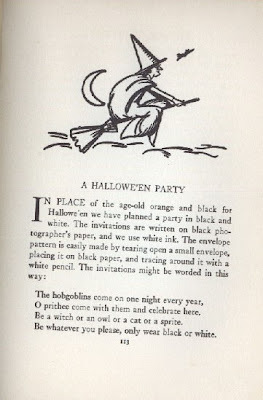 I have included an invitation from the book My Book of Parties by Madeline Snyder. This book was printed in 1929. Here is what my kids where for Halloween. 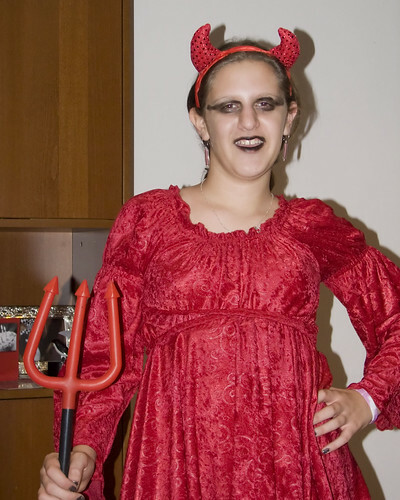 My daughter the demon. Yes, I sewed her dress. 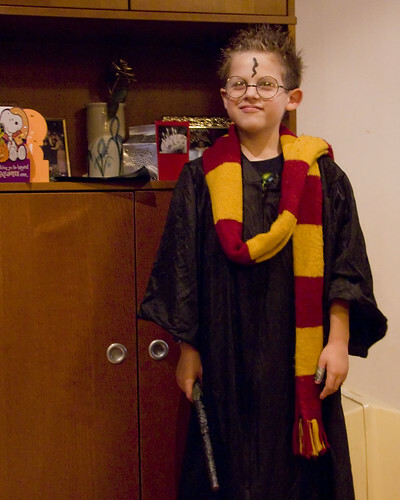 My son as Harry Potter. The Hogwarts robe is my college robe hemmed up. The scarf was knitted by my mom years ago when my daughter was Hermione. O.k., after all that are you going to tell us what your kids are going as for Halloween? Got two cats and Hulk Hogan over here. Cute costumes! Does your copy of My Book of Parties by Madeline Smith list the illustrator? In 1930 Doubleday published a bunch of excerpts from various books without including the illustrators names -- or even bothering to repaginate the pages -- for their The Big Vacation Book for Girls. I'm trying to catalog it for my library on LibraryThing. I'm a former librarian anyway, so I find the lack of information frustrating (as was manually counting the pages: all 615 of them). Can you help me, please? My book of parties / by Madeline Snyder ; drawings by Erick Berry.